As I add more years on to my age, I grow more and more concerned about getting our youth involved. A few of my students approached me about advising a Hunting/fishing club and without a doubt I accepted. 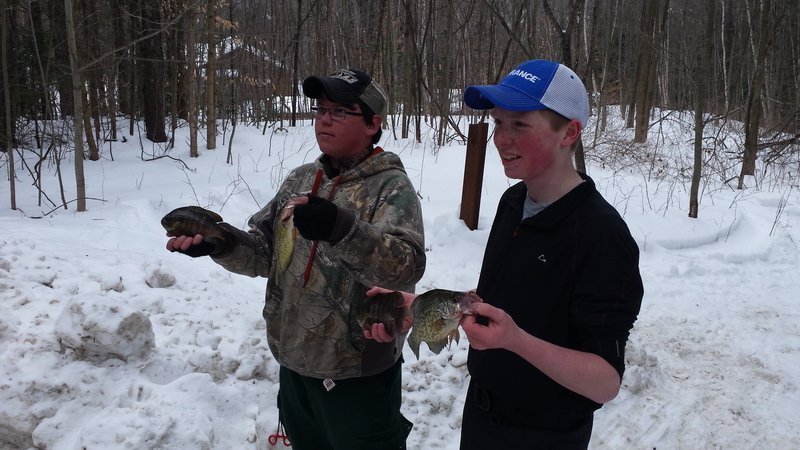 I’ve had the chance to take them on the ice few times this year and as February break was almost over I took two of them to what I thought was going to be a hot bite and a positive time on the ice for these youngsters. We made our way to the lake with a few extra Vexilars for the boys to use. Dylan and I had fished this spot the previous week and it was a hot bluegill bite. I thought it was going to be an easy day for the boys giving them a little confidence by putting some fish in their buckets. I drilled the area out and got the boys all set up and ready to jig. It didn’t take long for the two of them to start a baseball game, there was a great deal of swinging and missing going on as I fished beside them. After a few tips on presentation and ready the electronic in shallow weeds they were both hooking up a bit more. We fished for a few hours and I soon realized that the fish just weren’t here. I cut another grid of holes and went searching. I was able to locate some fish but they had slid to the weed edge in 9 feet of water and the weeds were right to the ice. This wouldn’t be a problem for me and Dylan but knowing that I had two young fishermen with me that had no experience reading electronics in thick weeds I decided it would be best if I took them to another body of water to target deep water suspending crappie. We packed up our gear and made the short trip to a nearby setback. This particular setback was well known for a decent crappie bite early ice and I was hoping there might still be a few fish we could talk into biting. The conditions were poor, we had about 16 inches of heavy snow to deal with. I sent the boys out to clear a few spots in the channel for me to drill about 20 holes. It didn’t take long for one of them to get hooked up. As a matter of fact I don’t think I had even got my rod out yet. 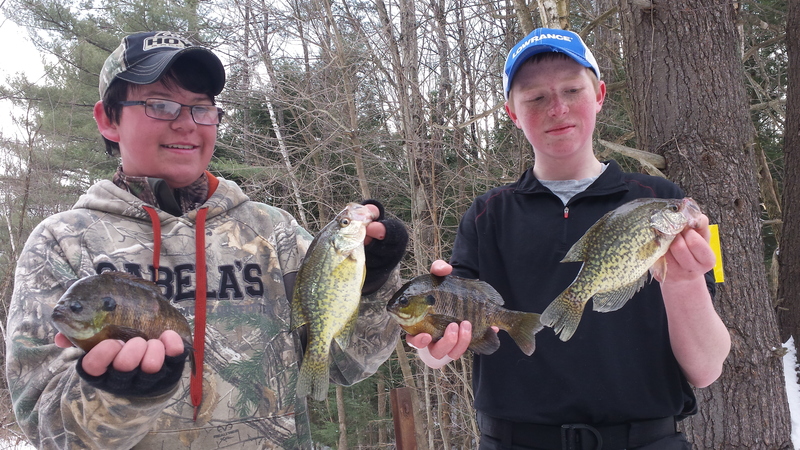 The first fish to come up was a decent little crappie, which to these boys was like pulling up a piece of gold. We had a short spurt where the fish would bite but it seemed like you’d only catch fish out of a hole that was fished for the first time, these fish are the fussiest crappie I have ever met. Both boys were able to catch a few fish, one even landing a nice pike. That’s what this sport is all about. Teaching and passing on what we have learned to the generations will only support a positive experience for those to come. Previous Post3-1-15 – Where Was The Warm Weather?Next Post3-5-15 – Spring Is Coming!